When your teammates go out of their way to give you a shout-out, you must be doing something right. So, just who is Oscar Lindberg? According to New York Rangers netminder and Swedish sports star Henrik Lundqvist, the 24-year-old Lindberg, in his rookie season, is an emerging star that knows how to play the game. That’s just what Lundqvist told media members after a Blueshirts victory, one in which his fellow Swede played a key role in securing. While Lindberg didn’t receive the same fanfare as other notable rookies prior to the start of the 2015-16 NHL season, he’s made people stand up and take notice of his top-shelf talents. Another Ranger blueliner, Keith Yandle, has also been impressed with the 57th overall pick in the 2010 NHL Draft, who was dealt from Phoenix to New York in May of 2011. Beyond the numbers – 10 goals and 17 points in 34 games – Lindberg has also earned rave reviews from teammates for his approach and preparation. 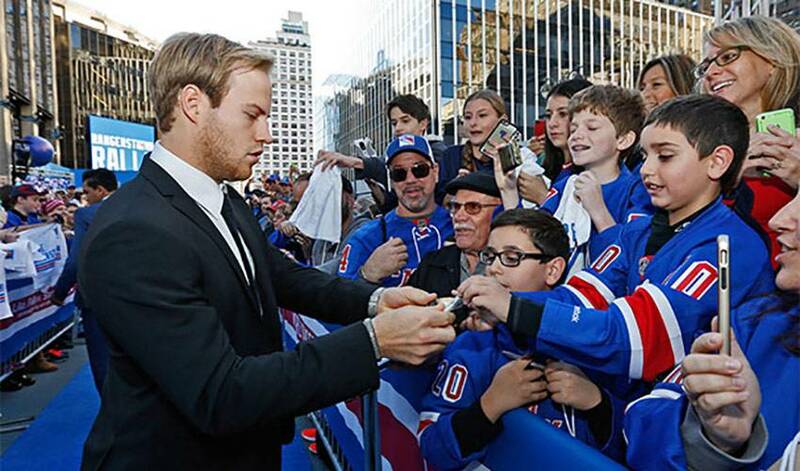 Less than 40 games into his NHL life, Lindberg, who struck gold with Sweden at the 2013 World Championships, will look to maintain his impressive contributions on a Rangers squad looking to go beyond the Conference finals. Last season, they were eliminated in the Eastern title series by Tampa Bay. It’s just the kind of talk you’d expect when you’re no longer a best-kept secret.